The Spark, open fall 2017, enables faculty to use the most innovative technology in a state-of-the-art facility to help motivate students to engage deeply in learning. A committee of WSU faculty, students and staff worked collaboratively to create the vision and identify goals of the digital classroom building. The building embodies a space where technology will be used to enhance learning, for current and future Cougars. 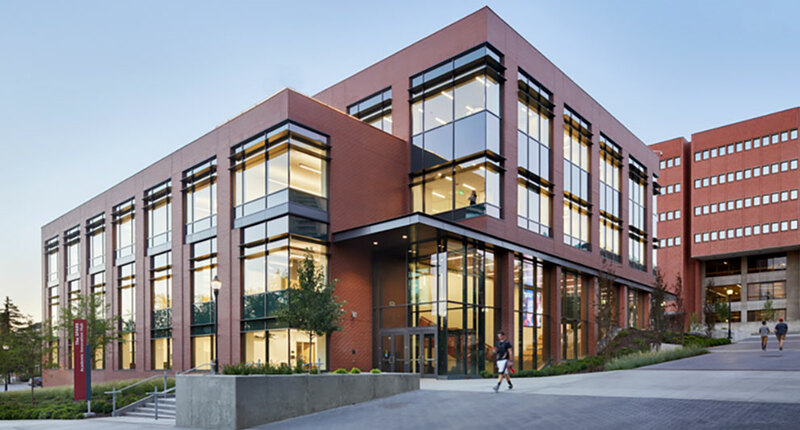 The four-story, 83,295 square foot building is designed for maximum flexibility allowing spaces to be configured for learning across multiple disciplines and reconfigured to accommodate changing needs. It includes both formal and informal learning spaces for small- and large-group learning. This video features one of the many faculty-led workshops that train classroom users how to make the most of the technology available in the state-of the-art building. This event highlighted the unique Active Learning Hall (Spark G45) “teaching in the round” classroom. Acclaimed guest educator and theatre artist David Harlan taught how this environment differs from a traditional classroom. He shared methods and strategies for engaging the entire classroom. For a list of upcoming faculty-led workshops, visit Learning Innovations Trainings and Workshops.